One of Paris’s finest department stores. 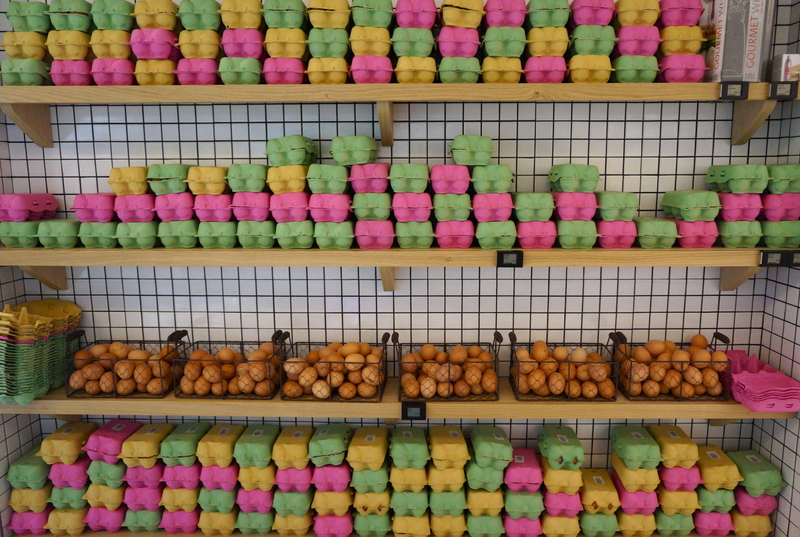 Le Bon Marché ‘eggcelled’ (sic) itself this week, with an eye catching display of les oeufs (eggs), which left us pondering all sorts of recipes but positively hankering after French Toast! All we could think about was this absolutely delicious breakfast, loved by children and adults alike. Here in France it’s called Pain Perdu, which means ‘lost bread’, referring to the use of stale or leftover bread revived miraculously with a little bit of culinary expertise. So, here’s the culinary expertise but, if you want to order it at a French bistro remember its called pain perdu! Not French-toast. Whisk together 6 eggs, a cup and a half of milk, the juice of one orange, a splash of vanilla extract, a tablespoon of sugar, the zest of a lemon, sprinkle cinnamon, nutmeg, and salt in a bowl then set aside. Place bread – ideally brioche – in a shallow baking dish large enough to hold bread slices in a single layer. Pour egg mixture over bread; soak 10 minutes. Turn slices over; soak 10 minutes more or until soaked through. Place a wire rack on a baking sheet, and set aside. Heat 2 tablespoons butter and 2 tablespoons vegetable oil in a skillet over medium heat. Fry half the bread slices until golden brown, 2 to 3 minutes per side. Transfer to wire rack; place in oven while cooking remaining bread. Wipe skillet, and repeat. Keep in oven until ready to serve. Serve warm with maple syrup, if desired. PS: The blog/website is now up so you will be hearing more from us. Please share our blog posts and facebook pages to we can reach as many people as possible. Next post Taking the P out of Paris!